Michael Dyer ran for a one yard touchdown with 45 seconds to go as Auburn avoided becoming the first NCAA champion to lose their opening game in the BCS era. 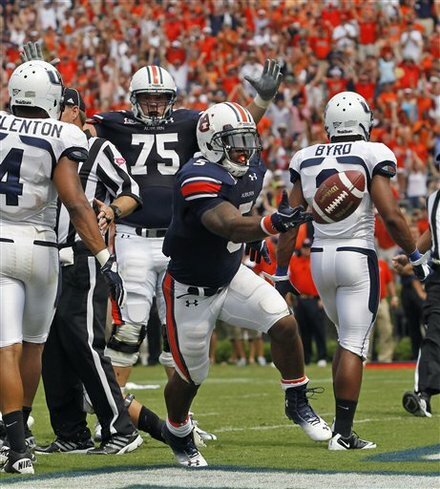 Auburn came back from a 38-28 deficit in the 4th quarter with 4 minutes left to score twice and beat Utah State 42-38. Barrett Trotter threw a 15 yard touchdown to Philip Lutzenkirchen with 2:12 left to cut the deficit to 3. With only one timeout remaining, Gene Chizik opted to go for the onside kick which Auburn executed to perfection. Michael Dyer would then punch in the one yard touchdown as Auburn avoided what would've been an embarrassing upset.